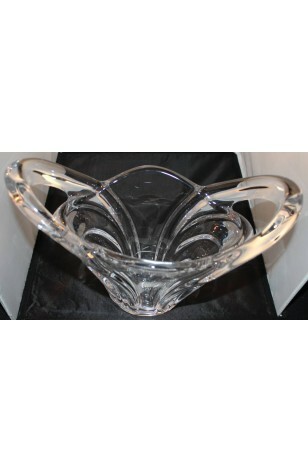 Vintage, Vannes Le Chatel Cut Large Crystal Basket Styled Vase, Made in France. Circa 1950 to 1970, Mid-Century Modern Period. This is an absolutely lovely Piece of French Cut Crystal from the 1950 to 1970 time frame, Made by Vannes Le Chatel. A beautiful Vase in the shape of a Two (2) Handled Basket, 9 1/2" Tall, 12" in Length, in an Extremely Heavy and Exceptionally Fine Crystal. A really great example of the "Mid-Century Modern Period". Vannes Crystal is highly sought after since it was made for such a short time. Excellent condition. This is an absolutely lovely Piece of French Cut Crystal from the 1950 to 1970 time frame, Made by Vannes Le Chatel. A beautiful Vase in the shape of a Two (2) Handled Basket, 9 1/2" Tall, 12" in Length, in an Extremely Heavy and Exceptionally Fine Crystal. A really great example of the "Mid-Century Modern Period". Vannes Crystal is highly sought after since it was made for such a short time. Very Good Resale Condition unless noted below or in picutres.